BUENOS AIRES – This is my friend Marielle. No, not the monkey, the other one. You may have read about her in some of my previous posts, but if not allow me to introduce her. 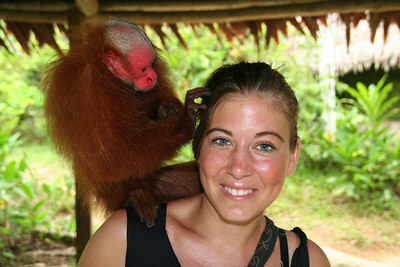 I met Marielle in Iquitos, Peru, when I went there for the Great Amazon River Raft Race. Marielle is from Holland where she left her job as a teacher to volunteer at a wonderful non-profit organization in Iquitos called Hogar Arco Iris, which in Spanish means "Rainbow Home." She's a great friend and an amazing role model to a lot of kids. 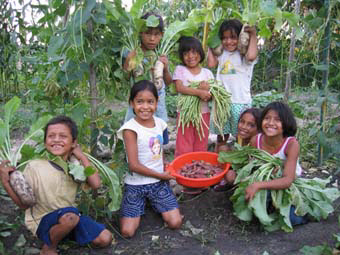 Arco Iris is home to about 50 children from Iquitos who are orphans or come from broken homes. Thanks to wonderful people like Marielle these kids have a real opportunity to make something of their lives in a place where it is so difficult to do so. They go to school, learn social skills, and are taught self-responsibility. They are even responsible for growing some of their own vegetables. During a year in South America I have seen a lot of charities, and this is a really good one. Which is why I am writing this post. Marielle has decided to enter a team in this year's Great Amazon River Raft Race at the end of September. She is using the event to raise money for a children's project in Iquitos, and I am asking everyone who reads this post to help out. This is a great opportunity to help some kids who have not been as fortunate as most of us, and I guarantee that with Captain Marielle at the helm the money raised will make a differnence in their lives. Everything helps, and in Peru a few dollars go a long way. If all you can afford is $10, please make a pledge. However, I know a lot of you can afford more – maybe $50 or $100. Heck, some of you spend $10 a day at Starbucks. (You know who you are...) So if you can pledge more, please do so. And don't let the numbers I mentioned be a limitation if you feel really generous! I know we all get tired of being asked to support one cause or another, and I wouldn't ask for your help unless I was sure it would make a difference. You will probably never meet these kids, but through Marielle you can make a difference in their lives. For information on sponsoring Captain Marielle's team visit http://www.challengemenow.org/ and look for Marielle Pepels. UPDATE: The Challengemenow website is very difficult to use and does not seem work most of the time, so you can make your pledge by posting a comment at the bottom of this page and including the amount of your pldege! (Your email address WILL NOT appear on this site!) I will provide you with either an address in the U.S. where you can send a check or information on how to send your pledge to me via PayPal, whichever you prefer. I will then deliver all of your pledges to Hogar Arco Iris in person when I visit later this year. Marielle reads this site and will see your pledges and any encouraging comments you leave for her! Climbing. Or not. In the rain.